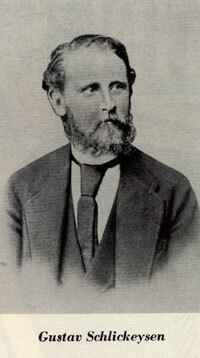 In 1875 Gustav Schlickeysen published a book called Obst und Brod - Eine Wissenschaftliche Diätetik – which was translated and re-published in New York, 1877, by M.L. Holbrook M.D. as: Fruit and Bread – a scientific diet. The front cover of that volume is below. The book (now on archive.org) follows very directly from the discoveries of Charles Darwin, his ‘On the Origin of Species’ first appeared in 1859; and ‘Descent of Man’ in 1871. 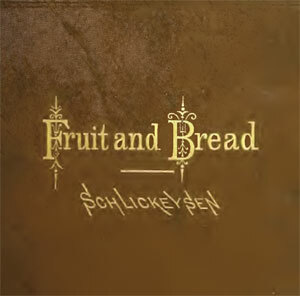 Schlickeysen lists only the later volume in his short bibliography and in his section on ‘Application of the Theory of Evolution to Dietetics’ – he claims to be the first to follow through on Darwin’s own suggestion that the earliest humans appear to have been frugivores, like the apes, which means they preferred to eat fruit, but not quite exclusively. He gives a very detailed account of comparative physiology of human and non-human animals – teeth, digestive systems, embryo/placenta etc., but also goes on to morals/ethics and of course diet. p.125: “Among animal products much consumed by vegetarians, milk is one of the most common. This however, is not only entirely unnecessary, but in many cases, positively injurious.” – he continues by stating that milk is just for the new-born, only humans use it as adults, and he describes butter and cheese as an ‘excess of fat’. 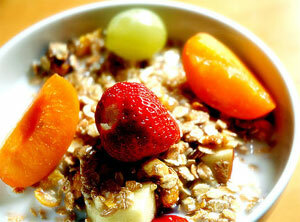 - he also argues against pastry, tea, coffee, chocolate, alcohol, tobacco, as well as all flesh foods. The only exception to the ban on cooking was whole-wheat bread made solely with unrefined flour and water, well kneaded, then baked. Rather oddly, throughout the entire book, Schlickeysen makes no mention at all of vegetables. The question of whether to eat roots, greens and other vegetables are just avoided, even though many of them are fine eaten raw – salads were nothing new, even then. One of the most significant was Maximillian Bircher-Benner, who adopted a raw-food regime at his clinic in Zurich, Switzerland, though he did include raw vegetables and even small amounts of milk products. In 1900 he invented a new breakfast of fruits, nuts, and grains – the perfect Schlickeysen combination - what we now know as muesli. The original had a lot more fruit and a lot less grains than the supermarket versions we get today, and there are some claims that it was originally eaten with orange juice, not cow’s milk (though today there are of course plenty of plant milks available). So next time you’re munching your breakfast muesli, spare a thought for Gustav Schlickeysen who started it all way back in 1875. He was born on the 9th of September 1843 in Berlin, therefore he was German. He was born as the seventh child of the family, of premature birth, and was always weak and often ill. Only thanks to his vegetarian diet he was able to survive and lead a rather normal life. He published two books, besides "Obst und Brod" he wrote "Blut oder Frucht", in English: Blood or Fruit. We have both books in the VEBU library. Schlickeyen emigrated to the US, where he hoped to find find a paradise of liberty, but he had to work very hard, 10-12 hours daily, to earn a minumum of money for a rather miserable/poor life, and in the nights he wrote his books. As philosopher and sensitive man he felt very unhappy in the materialistic world of North America, and always hoped to be able to return to Germany, but in vain. In 1893 (no exact date known) he died in Jersey City, New York.